These days, it seems all we hear about is “going mobile.” Our phones have long since been mobile and the days of being “unreachable” are all but non-existent (whether we like it or not). The same holds true with our finances. Most of us carry bank debit cards, traditional credit cards and perhaps a few charge cards. Access to our assets is as easy as swiping a card. But what happens when we’re at a flea market, riding in a cab or having carry-out delivered and the merchant has one of those new mobile credit card readers? Can we trust that technology? 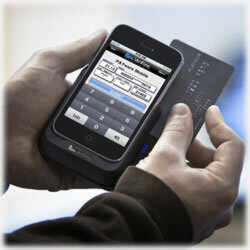 Can we allow the merchant to have our card and know that the information his mobile reader gathers won’t be stolen? We went straight to the industry leaders to find out those answers. Because these new portable card readers incorporate the same technological advances as their more traditional counterparts, your information is encrypted in the same way. It’s not stored anywhere, so there are fewer concerns over the information getting stolen. There’s another reason this is a safer alternative; our debit and credit cards are safer than carrying cash. It’s important to keep in mind that the availability has been around for several years; it’s only in recent years that we’re seeing more merchants incorporate these mobile credit card readers. New York City cab drivers have been using them since 2004 with minimum problems. That “learning curve” that’s present anytime new technology is introduced has long since been dealt with. It’s simply the need has grown and as a result, companies such as Verifone have stepped up their game to make the technology more readily available and certainly more affordable for businesses to incorporate. The purpose is defeated if a card reader can only process one or two of the major card carriers. If it’s a card reader, odds are, it’ll be able to process any of your new cards or debit cards that has a magnetic strip. Even better, many restaurants are now incorporating these small devices. Instead of your waiter taking your card with him to process your payment, there’s a good chance your next transaction will be completed right at the table. This is an additional layer of security for your benefit – your card is never out of sight. Many of today’s contemporary card readers offer electronic signature capture and a PIN pad for those who like to use their debit cards. It really is all about the convenience and safety. If you’re concerned that a merchant’s card reader will be stolen, you should know that if it is, there’s nothing stored on it. The transaction is completed at the time of sale. Not only is your information safe, but the merchant’s information -and profits – are safe, too. He’s paid the moment the transaction is completed. The most a thief would benefit from stealing it is the unit itself, which could be his downfall since many come equipped with GPS security. That’s a risk most thieves don’t want to take and one that won’t benefit him even if he does get away with it. Besides taxi drivers and restaurants, you can expect to see these mobile credit card readers in a variety of places. Your lawn care company, next month’s trade show and the pizza delivery guy are likely the very ones who are incorporating these marvels today. From the concession stand operator at the ball field to your community’s annual fall bazaar, these devices have made it easy for merchants to go where the customers are. It’s truly a win-win situation for both the customer and business owner. Clearly, there are a multitude of reasons why these devices more than serve their purpose. If you’re still not convinced, you’ll still be able to use cash, of course, but you can rest easy knowing the mobile credit card readers are as safe as any other credit card transaction you make.